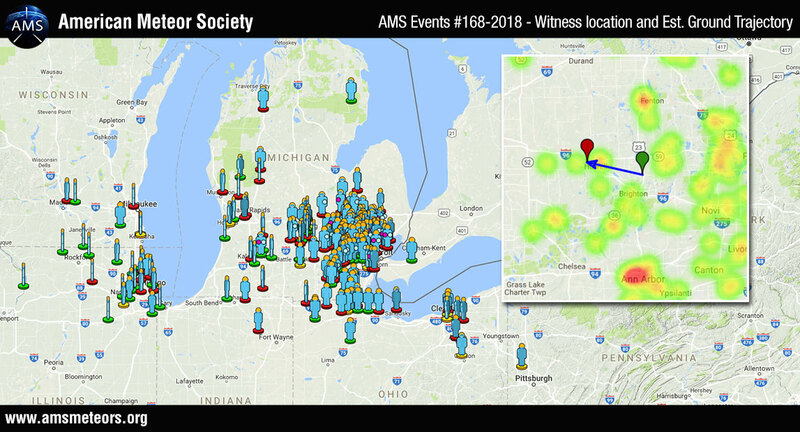 Seen across seven states, a meteor in the skies of southeastern Michigan quickly brightened into a fireball, and then exploded, filling the sky with flashes of bright blue-white light. Some witnesses heard a large BOOM! concurrent with the flash - many reported hearing the sound delayed. There have been numerous reports of houses shaking, windows rattling, and frightened pets. "Major event in Michigan. Server is getting overloaded. We'll be back asap, check back soon. If you saw the fireball report it here: fireballs.imo.net"
One of the more interesting reports I saw was that the shock-wave from the event was so powerful that it registered as a 2.0 earthquake! One of the cameras in NASA's All-sky Fireball Network saw the meteor. Using the map of the object's trajectory from the American Meteor Society, I think purple oval is a good estimate of where any meteorites from this event may lay. This area is known as a strewn-field, and it stretches from Howell, Michigan, along the I-96 to Williamston, Michigan. At the time of this writing, I have not heard any reports of damage or meteorite finds. I had a short phone interview with a reporter from FOX 2 Detroit about the event, which showed up on the evening news! I was also interviewed by a reporter from the Detroit News. As I was writing this post, I found that many of the details I told to that Detroit News reporter ended up in an article the Washington Post! The gray pixels in this image show radar reflections off of falling meteorites at altitudes between 1.2 to 1.8 miles. Credit: Marc Fries, Ph.D.
UPDATE: The Detroit Free Press posted an article with this image - NASA: Meteorites probably in Livingston County's Hamburg Township. The article states "Doppler weather radar picked up material falling in [the Hamburg Township] area shortly after the meteor was reported at roughly 8:15 p.m."